17.04.2019 – Liudvika Leišytė is co-editor of the new publication "Higher Education System Reform: An International Comparison after Twenty Years of Bologna". The Bologna Declaration started the development of the European Higher Education Area. The ensuing Bologna Process has run for already 20 years now. In the meantime many higher education systems in Europe have been reformed – some more drastically than others. 16.04.2019 – Prof. Leišytė has joined the editorial board of the open access journal "Social Inclusion". Social Inclusion is a peer-reviewed journal, which provides academics and policy-makers with a forum to discuss and promote a more socially inclusive society. The journal aims at being an interdisciplinary journal, covering a broad range of topics, such as immigration, poverty, education, minorities, disability, discrimination, and inequality, with a special focus on studies which discuss solutions, strategies and models for social inclusion. 10.04.2019 – It is our pleasure to invite you to the guest talk by Prof. Pille Pruulmann-Vengerfeldt (Malmö University, Sweden) at the zhb Higher Education Research Colloquium Series. On Wednesday, May 8, 2019, Prof. Pruulmann-Vengerfeldt will give a talk with the title "Students as audiences in the cross-media learning world". 20.03.2019 – Liudvika Leišytė will attend the annual conference of the German Association for Higher Education Research (GfHf) on March 21-22 at the Otto-von-Guericke-Universität Magdeburg. The conference focuses on knowledge production and science communication in a changing working and living environment and prof. Leišytė will chair two sessions on the topic "Transformation of Science" and will participate in the panel discussion "Internationalization of Science – Opportunities and Potentials of International Cooperation – What Role does it play for the Development of Society?". 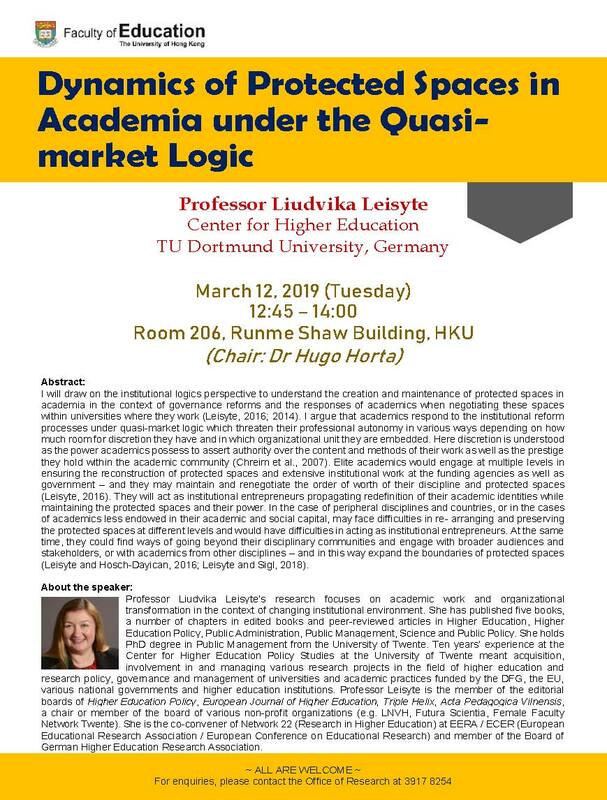 07.03.2019 – Liudvika Leišytė will give an invited talk on "Dynamics of Protected Spaces in Academia under the Quasi-market Logic" at the Faculty of Education of the University of Hong Kong on March 12. Sponsored by the short-term speaker scheme of the UHK, she will share her findings about the creation and maintenance of protected spaces in academia in the context of governance reforms. 04.03.2019 – Prof. Liudvika Leisyte and Sude Peksen presented the preliminary findings of the Lithuanian part of the APIKS project at the APIKS project conference in Japan "An International and Comparative Study of Academics' Teaching and Research – Activities in the Knowledge Society: Main findings from the APIKS project". Their presentation focused on "Teaching and Research at Lithuanian Universities". The conference was organized by the Research Institute for Higher Education of Hiroshima University, Japan, March 4-5. 22.02.2019 – It is our pleasure to invite you to the guest talk by Prof. Dr. Ray Land (University of Durham, England) at the zhb Higher Education Research Colloquium Series. On Wednesday, February 27, 2019, Prof. Land will give a talk with the title "Threshold Concepts and Troublesome Knowledge: a transformational approach to learning". 16.01.2019 – Dear students, applications for seminars in the summer semester are coming up! You can find all information regarding the seminars of the Professorship of Higher Education on our teaching website.